It’s hard to imagine the timing being much worse for a sitcom whose first episode finds two principal characters providing sexual favors in return for anticipated career advancements. Yes, the stench of Harvey Weinstein wafts over the Audience network’s Hit the Road, which was filmed and developed long before he became Hollywood’s latest most virulent scourge. Jason Alexander of Seinfeld fame stars. And he nonetheless is pretty riotous throughout the first two episodes of what amounts to George Costanza maniacally micro-managing a very ribald mockup of The Partridge Family. Wait a minute. Audience network? What’s that? Well, it’s commercial-free, owned by AT&T Inc., and is available only to DirecTV (Ch. 239) and AT&T U-verse subscribers. The investment in original programming has been ramped up considerably of late, with Hit the Road premiering in tandem Tuesday night with Loudermilk after Mr. Mercedes (adapted from a Stephen King novel) launched in August and completed its Season One, 10-episode run earlier in October. On the scripted comedy series front, only Julia Louis-Dreyfus has scored big following Seinfeld, with HBO’s award-showered Veep making her a perennial Emmy winner. Jerry Seinfeld’s numerous specials and hosting role on Comedians in Cars Getting Coffee have kept him very much in play while Michael Richards has been a vanishing act in recent years. Alexander since has gamely tried and failed as the star of ABC’s Bob Patterson and CBS’ Listen Up!. But his prowess as a hapless schlub with grand plans is still in working order. Visibility-wise, Hit the Road may not amount to much more than a gravel driveway. Work is work, though, and Alexander really works this one. That it’s not. As a touring group with decidedly limited success, Swallow deploys Ken as manager/drummer/dreamer/schemer. 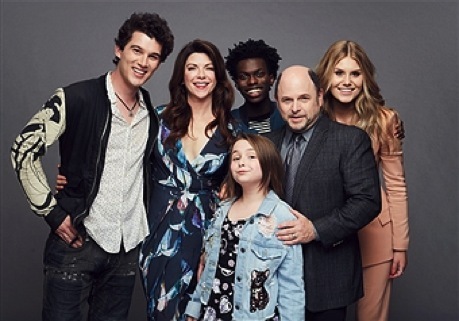 Playing and singing along are his wife, Meg (the under-appreciated Amy Pietz); promiscuous oldest daughter Rita (Natalie Sharp); dense, marijuana-peddling son Alex (Nick Marini); asthmatic, hyper-sensitive adopted son Jermaine (Tom Johnson Jr.); and activist little daughter Casey (Maddie Dixon Poirier). Watch for Pietz’s deadpan delivery of “That’s a kick in the bean bag,” which immediately should become a catch-phrase. Desperate to keep the tour on track, Ken begs a local radio station for publicity and in turn is propositioned. “We’ve all done things for the sake of the family,” he lamely explains to his wife. Forgive me for laughing almost uproariously throughout this whole seamy sequence, which Alexander manages to sell as few comedians could or would. Episode 2 finds the entire band camping out in pursuit of a front-of-the-line spot outside an audition hall, only to find that the entrance is at the other end of the building. During the process of finagling his way back to the front of the line, Alexander fires off Costanza-esque riffs on the digestive evils of “street meat.” Also included is a running bit on The Godfather, climaxed by “You Fredo’d me” in reference to the late John Cazale’s classic portrayal of lesser, ill-fated brother Fredo Corleone. Meh. Hit the Road is relentlessly broad and determinedly offensive. It’s also quite funny in fits and spurts, primarily when Alexander is throwing the fits and having the spurts. So I’d watch it again -- if I had DirecTV. Many would-be samplers also will have the same overriding problem.